Brandon Bird's Brandon Bird-O-Rama! : Lunchbox Time! I made lunchboxes! Available in “Eric Roberts“ and “Gran Torino“ styles. 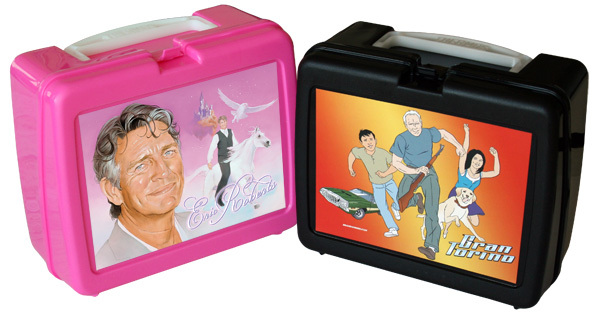 These are genuine plastic Thermos-brand lunchboxes, some of the last ever manufactured (I know that because I had to make a bajillion phone calls to track down a supply). Perfect for holding your lunch, your art supplies, your Star Wars action figure collection, pretty much anything that can fit in an 8” x 7” x 4” box (image area on the front measures 7” x 5.25”). Click here to go to the ordering page!